Connecting and informing the faith community how to integrate ACE concepts into the faith-based community. Thirteen faith leaders, behavioral health providers, and community leaders gathered on August 12 in City Heights for an introduction to the science and practice of adverse childhood experiences, and to hear about an upcoming series of workshops about mental health services in their communities. The series, which is led by Pastor Jesus Sandoval, chair of the Faith Based Academy, intends to bring together 25 Hispanic and 25 African American ministries with staff from San Diego County's Health, Human Services Agency. The series is supported by Urban League of San Diego County, which created The Faith Based Academy. The meetings are scheduled on Friday’s between 6:00 pm - 7:30 pm at Price Charities, 4305 University Avenue, San Diego, Suite 610, 92105. Light dinner provided. I was invited to give a 30-minute presentation about the science of adverse childhood experiences. When I asked how many in the room knew about the CDC-Kaiser Permanent Adverse Childhood Experiences Study (ACE Study), most said they had not heard about it. The slide in my presentation that inspired the most discussion was the brain scan. The CDC-Kaiser Permanente Adverse Childhood Experiences Study (ACE Study) shows that childhood trauma is linked to the adult onset of chronic disease, mental illness, violence and being a victim of violence. The research, led by Drs. Vincent Felitti and Robert Anda measured 10 types of childhood adversity that occurred before the age of 18. They are physical, verbal and sexual abuse; physical and emotional neglect; a family member who has been incarcerated, is abusing alcohol or drugs, or is depressed or has a mental illness; witnessing a mother being abused; and losing a parent to divorce or separation. Of course there are many other types of childhood adversity – bullying, witnessing violence outside the home, being homeless, witnessing a sibling being abuse, experiencing a severe illness or accident – but this study focused just on these 10. The higher a person’s ACE score, the greater the risk of chronic disease and mental illness. For example, compared with someone who has an ACE score of zero, a person with an ACE score of 4 or more is twice as likely to have heart disease, seven times more likely to be alcoholic and 12 times more likely to attempt suicide. Of the 17,000 mostly white, college-educated people with jobs and great health care who participated in the study, 64 percent had an ACE score of 1 or more; 40 percent had 2 or more and 12 percent had an ACE score of 4 or more (i.e., four out of the 10 different types of adversity). Adverse childhood experiences (ACEs) contribute to most of our major chronic health, mental health, economic health and social health issues. This happens because ACEs cause an overload of toxic stress, which damage the function and structure of children’s developing brains, and also damage the body’s organ systems. The effects of toxic stress caused by ACEs can be passed from generation to generation. Resilience research shows that our brains are plastic and our bodies want to heal. We know the resilience factors that help individuals become and stay healthy: exercise, enough sleep, safe relationships, a safe place to live, financial health, good nutrition, and asking for help. But we’re just learning about how to create healthy families, and self-healing organizations, systems and communities. 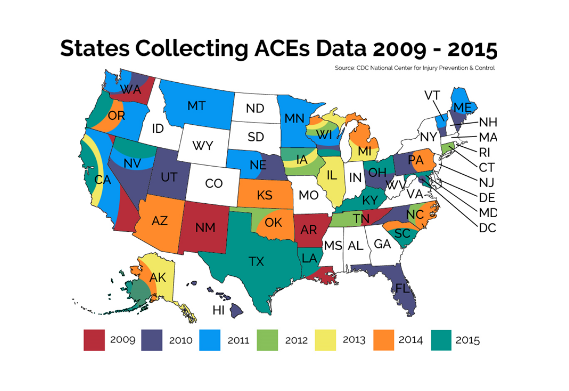 When I showed the attendees how many states have done their own ACE surveys, I encouraged them to have their organizations to learn about ACEs science and integrate trauma-informed and resilience-building practices. 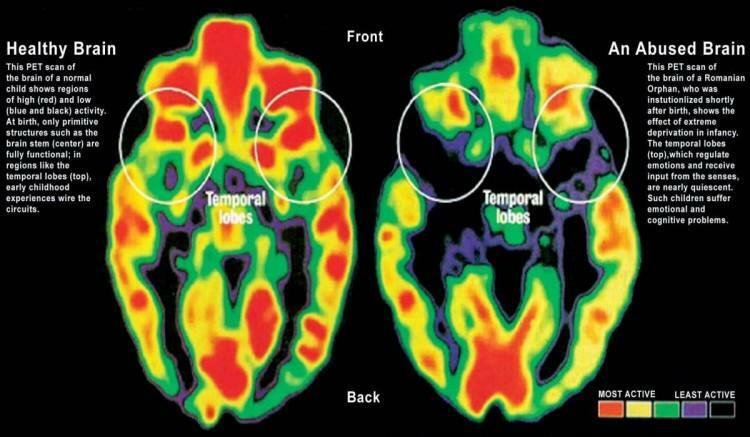 Dale, please know I just embedded your excellent brain scan image into the presentation slides and this blog post. Thank you so much!!! Such excellent coloring!! Dale and Jaime, please know on the bottom of this post is the link to the powerpoint. Please know I'll also email both of you gentleman separately the presentation slides. Thank you Dale for forwarding your link to a clearer image of the brain scan. Please know I'll replace yours with the one presently embedded into the presentation. Please know the powerpoint is attached to this blog, however, please know I'd like to embed the clearer image of the brain scan, resave, and repost. Please know I'll also send both of you via your emails the presentation slides also. Ditto. I'd love a copy of the slides. Thank you for the awesome contribution you are making in so many ways to so many communities! Peace. Thanks so much for sharing this Dana! Is it possible to get a copy of your PPT slides? And the slide with the brain scan? I like this material is there some kinda way I can contact you regarding this curriculum? What is the date for the super early bird registration? One of the concepts I try to invoke to the community is the transforming power of being there — connecting rather than separating.